After having what amounted to a vacation from city meetings last week, this upcoming week promises to make up for that lull. Here's a rundown of scheduled meetings that you may wish to attend or watch on television or streaming video when available. I'll cover each of them in more detail later. At 6:00 p.m. in City Council Chambers the Costa Mesa Planning Commission will hold its regularly-scheduled meeting. You can read the agenda HERE. 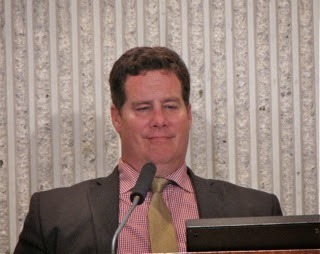 Among the items on the agenda are Public Hearings on a development at 270 Palmer; modification of a permit for the Orange Coast Buick dealership; revocation of the Conditional Use Permit for the Costa Mesa Motor Inn and New Business items to Revise the Planning Commission Bylaws and to hear from representatives of Orange Coast College on the "Vision 2020 Facilities Master Plan". 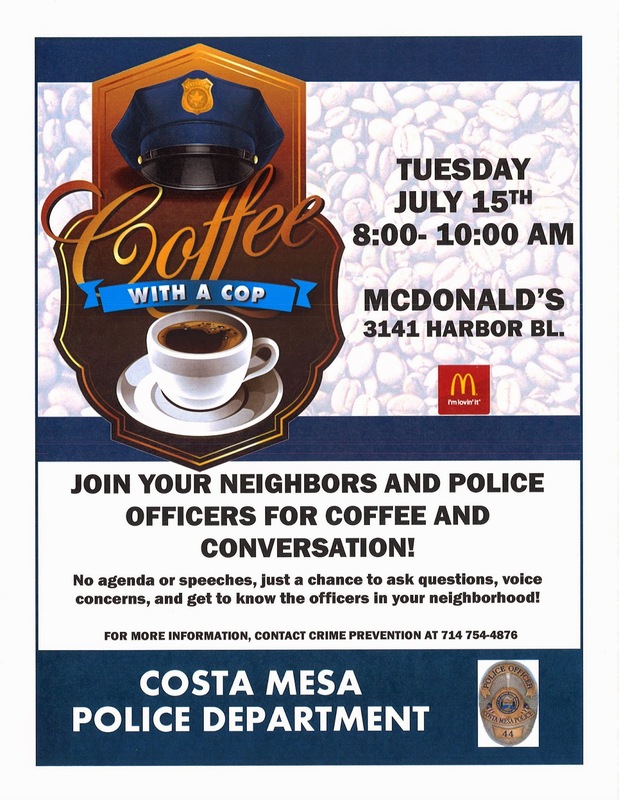 In the first of a series of meetings, members of the Costa Mesa Police Department will meet with public from 8:00 - 10:00 a.m. at the McDonald's Restaurant, 3141 Harbor Blvd. for an informal chat - just an opportunity to voice your concerns and get to know the officers in your neighborhood. The popular Concerts In The Park series continues, beginning at 5:30 at Fairview Park featuring Latin Jazz this time around. The Costa Mesa City Council will meet beginning at 6:00 p.m. in City Council Chambers with an agenda, HERE, that promises to be action-packed. I'll cover it in detail later, but here's an overview. Items of interest, beyond the Warrant on the Consent Calendar, include certification of special assessments for delinquent civil fines for municipal code violations; vacation of a portion of Superior Avenue; a lot line adjustment on 18th Street; Second reading of the Annexation ordinance for the so-called Santa Ana/Colleen Island Annexation; First reading of the new Motel Ordinance; Second reading on the Municipal Code section regarding rewards for information on vandalism of private property and - the BIGGIE - the second reading of the Conduct While Addressing City Council ordinance. As I said, more on this meeting later. Also beginning at 6:00, there will be a Public Hearing in the Orange Coast College Library, 2701 Fairview Road, Costa Mesa at which the above-mentioned Vision 2020 Facilities Master Plan will be discussed. This involves Measure M funds and will include more than 1.2 million square feet of expansion plus parking on the Fairgrounds parking lot. Wednesday there will be a General Plan Workshop, also at the Neighborhood Community Center, on July 16th beginning at 6:00. There will be an open house for the first hour, then a "Facilitated Discussion" for the second. 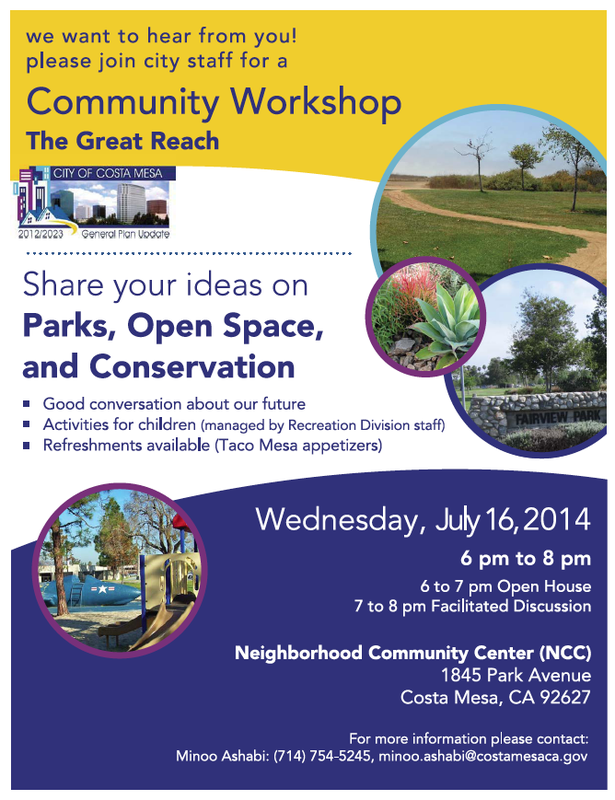 The topics will be Parks, Open Space and Conservation. This will be a great opportunity for you to hear about future plans and to provide input to the City on them. See you there. In a press release issued yesterday, below, the City of Costa Mesa announced that Travis Karlen has been named Recreation Manager, replacing Bob Knapp who left earlier in the year. 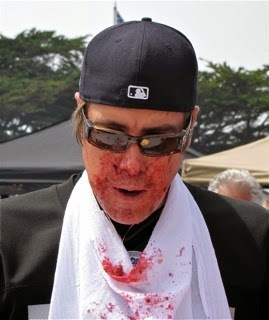 I could find no verifiable photograph of Karlen. According to the press release, Karlen comes to Costa Mesa from Maricopa, Arizona, where he held a similar position since late last year. Prior to that he worked in municipal recreation in Minnesota. The press release says he has 20 years experience in parks and recreation, although he apparently graduated from high school in 1995 and from college in 2000. According to information available online, Karlen has a musical background, too. Travis Karlen, a 20-year veteran in the field of parks and recreation, has been named recreation manager for the City of Costa Mesa. Most recently, Karlen was recreation manager for the City of Maricopa, Arizona. Before that, he held municipal recreation positions in Plymouth and Skakopee, Minnesota. During his career, Karlen has managed a total of six aquatics facilities, one amphitheater complex, a community center that housed a fitness facility, ice arena, gymnasium, meeting spaces, teen center and skate park. Karlen’s first day will be July 28. Karlen’s annual salary will be $105,516. 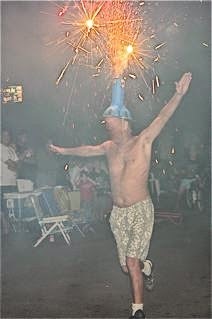 We here at A Bubbling Cauldron hope you all had a safe and sane Independence Day this year. We spent our holiday where we could grab a taste of small town Americana and not have to worry about a week of illegal fireworks ruining our sleep and causing neighborhood pets to become apoplectic. 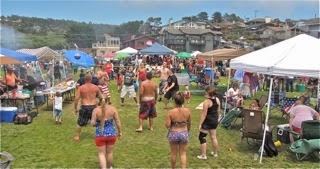 We journeyed to the small Central Coast community of Cambria, where being found even possessing fireworks - "legal" or illegal - carries with it a MINIMUM $2,000 fine! As a result, during our several-day visit we heard NOT ONE firework being discharged - except on the evening of the 4th, when the entire community gathers to watch a professional fireworks show being shot off from the beach. I couldn't help but contemplate how this little community - right at 6,000 permanent residents - manages to get along without so-called "safe and sane" fireworks when we here in Costa Mesa seem to be unable to even contemplate life without them. 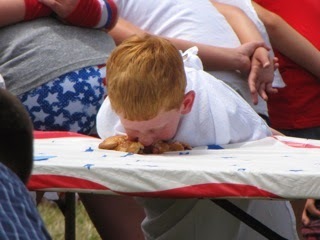 They condense the celebration into one day - July 4th. 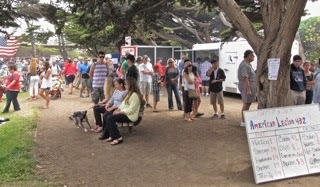 They have an all-day party in a large municipal park right at the beach. 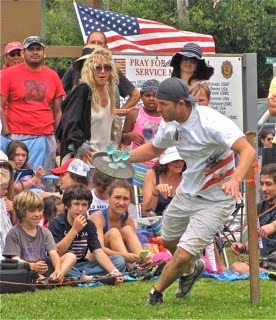 Thousands of residents and visitors to this tourist-oriented town gather for food, music and fun. 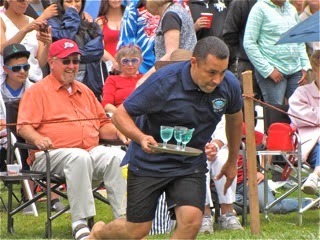 There are waiter/waitress races, where teams from local restaurants have a great time competing against each other for bragging rights for a year. 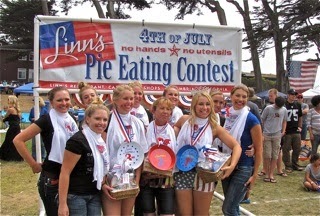 There are pie-eating contests sponsored by a local establishment famous world-wide for their Olallieberry Pies. These contests are a hoot! 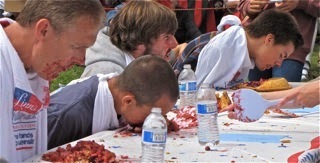 Contestants must eat a pie hands-free with the ten-minute time limit with no assistance except from a "scraper", a person who helps keep the pie stacked in front of the eaters. 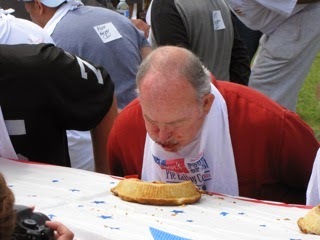 So, it's face-down, gobbling the pie until not a morsel is left on the table. The boys and girls and the women eat small pies but the men must devour a full-size FOUR POUND Olallieberry pie. 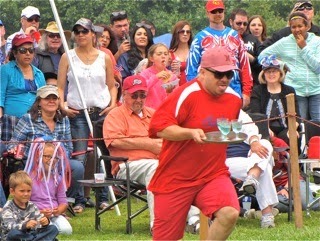 The record, set last year, is five minutes, eleven seconds - set by the fellow who finished a distant second this year. The winner this year finished well over seven minutes. In the women's competition, contestants from the Miss California Mid-State Fair competition - including the the recently-crowned Queen, Sabrina Dunn from nearby Templeton - participated. 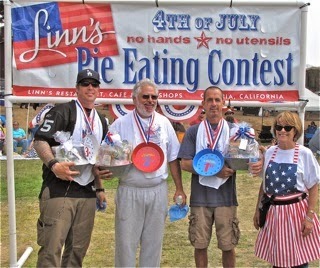 In fact, Dunn won the pie eating contest! Last year's queen, and a runner-up this year, Eloida Moore from Cambria, also competed. 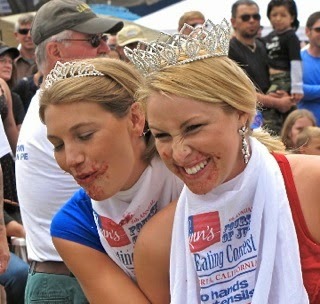 When was the last time you saw a beauty queen with pie jammed up her nostrils? 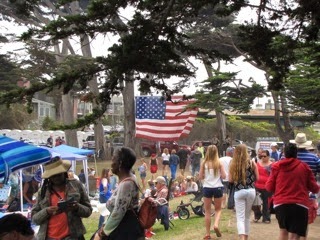 There were stands selling hot dogs, hamburgers, tri-tip sandwiches, drinks, strawberry shortcake, corn on the cob, pies and Independence Day baubles as fundraising events for a variety of community needs. There were families making a real celebration of it, with pop-up shade shelters, coolers full of food, beverages and lots of fun and games. 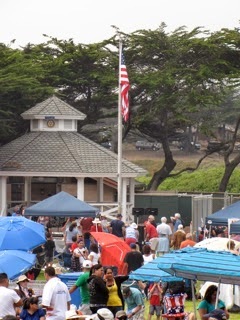 There was music from the permanent bandstand from 9:00 a.m. until the fireworks began more than half-a-day later. The highlight, of course, is the discharge of the professional fireworks show that begins after dark - this year it started at 9:15 - and continues for around 45 minutes, or until all the shells have been fired out over the ocean. Friday was an overcast day - as is the case most days on the Central Coast this time of the year when the intense heat inland Paso Robles environs pulls a blanket of fog ashore along the coast. 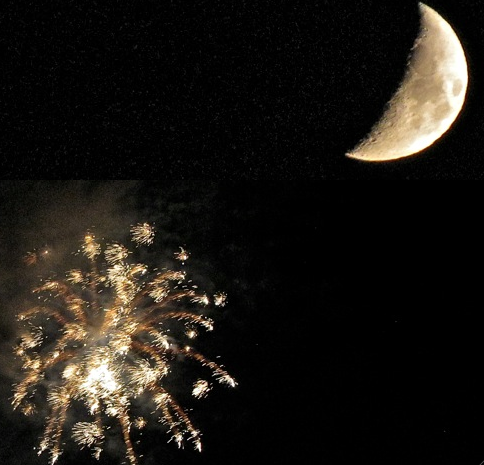 Sometimes that fog lingers into the night and the fireworks are just colorful puffs in the clouds. This year, though, at sundown the fog - right on cue - withdrew a few miles offshore and the celebration proceeded under a cloudless sky with a chunk of moon looking down. In the meantime, back here at home our public safety folks were out in force, trying to protect the city. 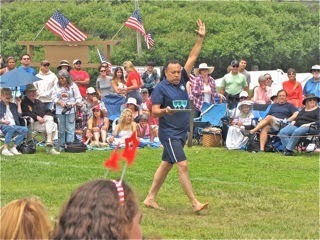 According to sources, Fire Chief Dan Stefano had a few extra staffers on duty for the day and night. He had three arson investigators teamed up with police officers for much of the night. I'm told we had approximately half our police force on duty on Friday - including Chief Tom Gazsi, who was in uniform, on the streets trying to maintain peace on a day when the combination of patriotic revelry, safe and sane fireworks masking the use of illegal stuff and too much alcohol created some difficult times - including a tragic event where an allegedly-drunk woman crashed into two people who were in the middle of West Wilson Street setting off fireworks, HERE. According to sources, both those young people remain in a trauma unit with serious injuries.